Narai shop is located roughly in the center of “Narai juku”, one of the Kiso 11 post stations on the Nakasendo from the Edo period. 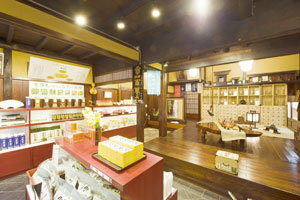 This shop used to be one of the typical Narai juku private homes in the late Edo period. Inside the shop, we display and sell herbal medicines and herbal medicine formulations such as the gastrointestinal drug, Hyakusogan. The townscape along the Nakasendo was selected as one of the Important Preservation Districts for Groups of Traditional Buildings by the Ministry of Education, Science, Sports and Culture in 1978. The post stations of the Nakasendo are given Michelin stars and are collectively listed as one of the places of “1,000 Places to See Before You Die” which was published in America. This townscape is visited by lots of foreign tourists. 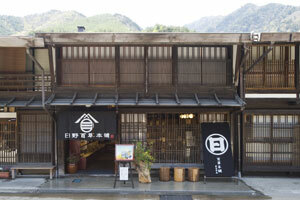 The counter where our products such as Hyakusogan are sold. There are displays of our products, a map of the 11 post stations of Kiso, and Hyakuso and great literary figures near the entrance. Behind the retail space on the 1st floor is a display corner. Feel free to step in. There is a nostalgic irori fireplace. Visible in the back is a Hyakumidansu (medicine chest), where apothecaries used to store herbal medicines, combine them as necessary to sell them. The display of Japanese-Chinese herbal medicines used for our Hyakuso, etc.